Mysterious freighter guy Miles Straume (Ken Leung, formerly of "The Sopranos"), left, makes camp with Sawyer (Josh Holloway) in what looks like a prelude to trouble. Working on a hit television show sounds glamorous. Until you actually do it. On this day in a jungle in Heeia, on Oahu's Windward side, slate-colored skies threaten rain. On the set -- a brief yet bumpy off-road drive from base camp, where trailers and a rudimentary buffet are stationed -- the crew erects two canopies. But humans don't warrant shelter. Cameras and monitors do. A communal can of bug spray and canvas chairs provide the only respite from mud, wild foliage and aggressive insects. >> On TV: New episodes resume at 9 p.m. Thursday on KITV/ABC, following the return of "Grey's Anatomy." >> Coming up: Four new shows follow, with a two-hour season finale May 29 (no episode on May 22, when "Lost" is pre-empted by the season finale of "Grey's Anatomy"). In those chairs sit actors Michael Emerson, Terry O'Quinn and Jorge Garcia, dutifully subjecting themselves to makeup artists who proceed to worsen their appearance. An artist dips a brush into a painter's palette to add more purple blotches under Emerson's eyes. Another tends to O'Quinn's scar. Garcia tilts his head to accommodate a hair specialist who fiddles with his long locks. Next up? Faux dirt on arms and neck. It's all part of the much-anticipated return of "Lost" on Thursday, which signals the beginning of what the crew calls "Season 4.5." 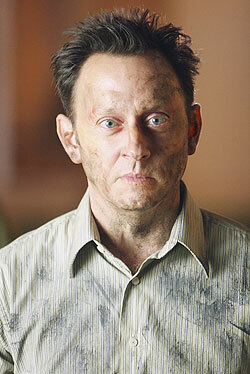 The episode features Michael Emerson (Ben Linus) in a pivotal role involving strenuous work (horses! fighting!) that launches the furious ride to the May 29 finale. Michael Emerson, shows that 'Lost' life is not so glamorous. The writers strike interrupted what began as a stellar year, with the first eight episodes landing solidly in Nielsen's Top 10. Everyone returned to work last month, and a mighty scramble to finish five of the eight remaining episodes ensued (subsequent seasons will compensate with extra episodes). Everything must be completed before the hiatus begins next month. So multiple units shoot scenes from several episodes in various locations simultaneously, not necessarily in chronological order, leaving the actors moderately confused about continuity and their characters' state of mind at any given moment. During the alfresco makeup session, Emerson consults director Paul Edwards about Ben. The word "sociopath" floats in the air. One moment Ben is charging about, shouting orders. The next he mopes and whines. "I'm just curious about the change of character," says Emerson. Next to him, Terry O'Quinn plants a yellow straw hat on his head between scenes, strums his ukulele and sings in a soft, melodic voice, letting his large hunting knife dangle at his side. After a brief lunch break at 4 p.m., the night session begins. Along the way, there's a campfire to monitor, and someone with arms the size of a cyclist's thighs must move rocks. Nearby, a crew member practices his steady cam shots by running alongside anyone who appears in his path. Another tinkers with a fake shotgun. The actors don't sit for long before it's time to do it all again. Repetitive performances must stay fresh. Several rehearsals take place before any film is shot. Each scene finishes with directions to the camera operators about extreme close-ups and angles, as well as discussion among the actors about the mood or timing of lines and movements. Before the director shouts "Action!" trucks, vans, cranes and dozens of people must fall silent. And they do this again and again, reminding any observer just how many hours of work necessitate every 30 seconds of compelling television drama.